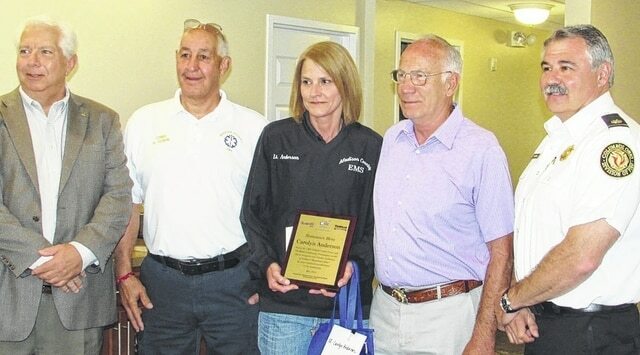 Paramedic Lt. Carolyn Anderson, center, was recognized Wednesday as a Hometown Hero by Sunny 95 radio and CME Credit Union during the National EMS Week Homecoming Breakfast held at Madison Senior Living Community. Anderson was instrumental in saving the life of Ron Kern, second from right, in 2013 following a tractor trailer accident. From left: Jim Riederer, CEO of CME Credit Union, Madison EMS Chief Bob Olwin, Anderson, Kern, and Dave Whiting, assistant fire chief, Columbus Division of Fire. LONDON – Ron Kern has no recollection of the day in May 2013. He does know who has allowed him to be standing in the midst of a group of well wishers on May 20 at the National EMS Week Homecoming Breakfast. She is Lt. Carolyn Anderson, a paramedic with Madison County Emergency Medical District’s Medic 280 of London. Anderson is a resident of Mechanicsburg. Anderson was recognized as a Hometown Hero by radio station Sunny 95 and CME Credit Union during the breakfast, held at Madison Senior Living Community in London. She was nominated for the honor by her chief, Bob Olwin, based on her response to the call to the accident in which Kern was involved. It was an incident over which, literally he had no control and he was the only injury. Kern, a tractor trailer driver for BST, was heading south on State Route 56. Just north of the two corrections facilities on a very windy day, a strong gust of wind — according to a witness — literally picked up Kern’s unit and blew it into the ditch on the northbound side. When Anderson and paramedic Shawn Harding arrived on the scene, they found Kern unconscious from the impact and barely breathing. “I could barely find a pulse,” Anderson recalled. Kern’s head lay to one side which caused an obstruction to his airway. Due to the crushed cab, Anderson had some difficulty reaching Kern to straighten his head to create an open airway. She then placed a device over his nose and mouth and forced air into his lungs to keep him breathing. Harding inserted a needle into his chest and lung to relieve pressure on the collapsed lung and allow the air to enter Kern’s body. After sections of the truck were cut enough to remove Kern, it was discovered he had been a firefighter with the Central Townships Joint Fire District by a shirt he was wearing. With the weather too windy for a helicopter to fly, once extricated, Kern was transported to Grant Medical Center in Columbus. Kern suffered a concussion, brain bleed, cracked ribs, nerve damage to his left arm. Nearly two years later, he remains under a physician’s care. Anderson was cited for placing herself in some personal danger to administer aid to Kern. She has been with the department since 1998. Dean Shipley can be reached at 740-852-1616, ext. 1617, on Facebook at Dean Shipley or via Twitter @DeanAShipley.